Lewis Meyer was a fireman who became a prisoner of war in Vietnam from February 1, 1968 to March 27, 1973. He was taken prisoner during the Tet Offensive and kept for five years under the most brutal conditions a man could suffer through. When he returned home, he found a world eager to forget his trauma as it was a nation’s trauma. The aftermath of a failed war Americans were eager to forget. But his family never forgot. They would never forget the plight of an American hero. On January 8, 2010, in a ceremony aboard the USS Midway, Rear Admiral William D. French, the Commanding officer for the U.S. Navy’s Region Southwest, presented the Purple Heart medal to Lewis Meyer. Thirty-seven years after coming home from Vietnam, Lewis Meyer was presented two Purple Heart medals and a Prisoner of War medal for his service. To understand the life of Lewis Meyer … as well as his former wife Gail and her husband, retired Air Force Colonel Dean Erwine … is to reflect and make some sense on the life of San Diego and the United States since the end of World War Two. It’s the life of three people growing up in San Diego and knowing each other since their childhood. Three average San Diego lives intertwined in the sweeping history of a nation conflicted over it’s changing role in the world. Above all it’s the story of family ties and loyalties which can hold a man together when he’s been sent to hell-on-Earth … and returned to find the world he left behind changed – for good and bad – forever. Lewis was a fire-fighter all his adult life and a military man most of those years. He served in the Army during the Korean War, and in the Air Force Reserves well into his forties. But from a time before he graduated Grossmont High School’s class of 1949, he was a fireman. He fought and trained to fight all types of fires – from wild fires in the Cleveland National Forest to industrial fires in combat environments. Even after he came home from Vietnam, he returned to fire-fighting. Lewis and Gail met when they were both in elementary school, and knew of each other growing up. But their first “date” was not until after high school when she met him at a party and he offered to drive her home. “Lewis’ car died and we had to push it back to my place. A couple days later he asked me out,” said Gail. “They never bothered me and I was friends with one of the leaders, but they were guys you didn’t mess with and Lewis was one of the toughest,” said Dean. San Diego in the early 1950s. Gail’s brother Mike Jansen, who now owns Gravel & Grit in Lakeside and lives in Ramona, described it as “an American Graffiti San Diego” of hot-rods racing down El Cajon Boulevard, and drive-in Movie Theaters, and farmland in areas so urbanized now, it is almost impossible to imagine any other lifestyle. A wide-open America and a wide open San Diego which people were just beginning to discover. Gail’s father Charles Jansen owned a number of small restaurants in San Diego city and county, including Jansen’s Smorgasbord in Horton Plaza, and “2-J’s” hamburger restaurants, which Gail noted was San Diego’s first chain of fast-food restaurants. “We had a restaurant on the corner of Pearl and La Jolla Boulevard as well as one just across the street from The US Grant Hotel. We had a place on 45th and Euclid and Lewis often worked for my dad. He became a son to dad,” said Gail. Lewis and Gail married in 1954 after he got out of the army. They had their first apartment on 45th street so Gail was able to walk to her father’s restaurant to work. Lewis began working for the Federal Civil Service in the Department of Defense as a fire-fighter. They raised a family and when Gail speaks of those early years, she remembers a time when patriotism knew no political brands or party … and the sorts of ideological divisions and fighting so common today were not a part of the American atmosphere. “When President Kennedy came to San Diego, Lewis took our eldest son Bill to see him. It was so exciting. They got down to El Cajon Boulevard early that morning. There was no Interstate 8 back then and President Kennedy’s motorcade drove down El Cajon Boulevard, with JFK sitting on top the back seat of his car waving to everyone. Like I said, a very different time,” noted Gail. John F. Kennedy came to San Diego on June 6, 1963 to give the commencement address at San Diego State. It would be his last time in San Diego. Five months later he was assassinated – shot while traveling in the same sort of open-topped convertible limousine Lewis Meyer and his son got up so early to see … and wave to him – wave to a President of the United States. In talking to Gail, Dean and Lewis, that is a recurring theme – how swiftly everything changed. President Kennedy’s death ushered in the world that would soon engulf Lewis and Gail. The Vietnam War began in earnest when Lyndon Johnson ordered an escalation of the war in late 1964. Lewis became a Crash Fire Supervisor in the Federal Fire Department and worked at North Island and Miramar. In 1964 he and his young family were sent to Subic Bay in The Philippines, where they lived on the naval base. Though not actively enlisted in the military, Lewis and Gail’s life was that of military life. “We lived on base and there was no distinctions made between the Navy families and us about whether we were part of the community or not. Everyone got along very well,” said Gail. Lewis hurt his back in 1965 and was sent home. But in 1966 his nephew Frederick Pulfifer, a paratrooper, was killed in Vietnam and the sadness of that loss led Lewis to decide he needed to go fulfill his nephew’s mission. “He had to go. It was that fire fighter’s instinct in him. He had to be where he felt he could help,” said Gail. 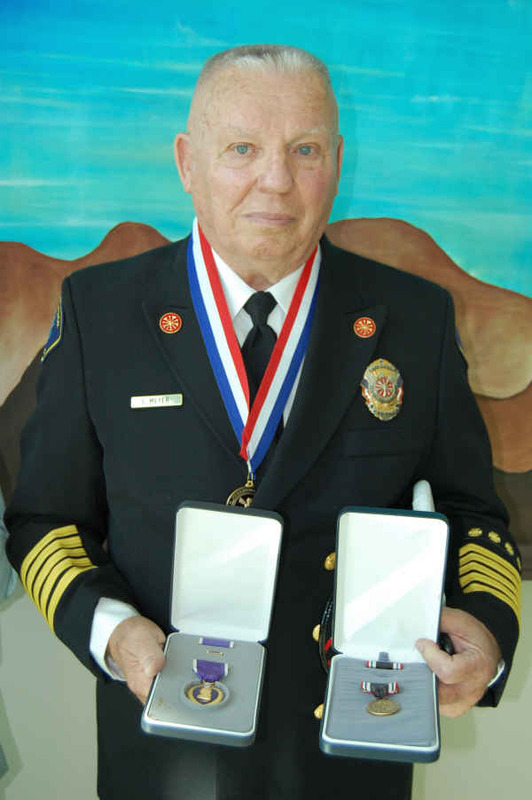 Lewis went to Vietnam in the Fall of 1967 as an assistant Fire Chief to help coordinate and standardize fire-fighting procedures. He was based with the Navy in Da Nang, but while on an inspection trip in the city of Hue, the North Vietnamese Army attacked and captured him and other members of the unit who were there. He spent 62 months in a Vietnamese prison camp. During an interview at the Gillespie Field Cafe in El Cajon, where he often goes for breakfast, Lewis, Gail and Dean talked about what happened the day he was captured. Tet marked the beginning of the Vietnamese New Year. The offensive was a coordinated attack by North Vietnamese forces which came at a time when White House and Pentagon officials were telling the American public the war was close to being over. The attack is credited with turning public sentiment against the war, which up to that point was still supported by a majority of Americans. Lewis suffered severe wounds from the attack, including several shrapnel wounds from rocket attacks, as well as having his ear-drums blown out. He was taken prisoner and subjected to daily torture. In one particularly heinous example, Lewis was brought into an interrogation room on the day of his son Jeff’s birthday. But the torture had it’s lasting affects. Thirty years later, Gail called Lewis on their son’s birthday and innocently asked him if he knew what day it was. In a flash, Lewis responded with the communist propaganda the NVA wanted him to repeat. “He was tough enough to stand up to them at the time, but it seeped into his mind and stayed there like a virus 30 years later,” said Gail. Gail’s own struggles with the war were almost as severe, since for many months she did not know if her husband was alive. She began working with Sybil Stockdale, wife of Admiral James Stockdale, and the League of American Families of POWs and MIAs, which was a group Mrs. Stockdale formed in the wake of her own husband’s capture and imprisonment. Gail tried hard to raise her kids in as normal an environment as possible during those years. She enrolled in college at San Diego State and studied Art and Psychology. She eventually got her Real Estate broker’s license. During her time as a student at SDSU she saw a number of anti-war rallies and felt the sentiments of her fellow students. She herself had doubts about the war and noted that Lewis had sent her a letter before his capture saying he felt the war was political and he was growing jaded. In March of 1973, the United States negotiated an end to the war in Paris, and soon afterwards Lewis was released with a number of POWs including John McCain. Lewis returned to a hero’s welcome at Miramar Naval base. He was invited with a number of POWs to have dinner at the White House and meet President Richard Nixon. He and Gail also went to a dinner in Beverly Hills given for the returning POWs by then-Governor Ronald Reagan. “At one point Nancy and Ronald Reagan came over to our table to say hello. Nancy thought Lewis was so cute she asked Ronnie if she could sit on his lap. Ronnie said if it was ok with me it was ok with him,” said Gail with a laugh. But soon after the hoopla of the POWs return was over, the plight of Lewis Meyer took a new turn. Psychological counseling was not in 1973 what it is for returning troops today. Gail observed that the government seemed to want to let the men “just get back to work” and ignore what they’d gone through. Lewis admitted that things such as his sons’ long-hair, and the societal cynicism he found towards the government, were hard for him to accept. Lewis suffered years of trauma in his adjustment and as a result, his marriage to Gail ended in divorce in 1978. But Gail insisted that they were not separating as a family even if they were divorcing. She kept in constant contact with Lewis and when she remarried – to Dean Erwine, now retired from the Air Force, it was this family connection that became the catalyst for Lewis finally getting the medals he deserved. Dean was instrumental in getting Lewis his due. Working with former Congressman Duncan Hunter and billionaire Ross Perot, Dean concluded that when Lewis was in Hue City and ordered to help defend the base, he was activated into the military and thus deserved the same considerations and benefits of any active duty soldier. “When they handed him a rifle and told him to fight, they basically drafted him. He was an active-duty soldier at that point,” said Dean. So now Lewis has his medals. He has the recognition he deserved to get in 1973. Gail says the military owes him the same hazard pay and combat overtime pay others got and she and Dean continue their fight for those benefits. She and Dean have never failed to support their friend Lewis, and his family stands with him as they always have. Cheers to Mr. Meyer and his admirable ethic of service to his fellow citizens. His life story is informative and inspiring; thanks to the author for sharing it here. Thanks Shane. Lewis Meyer is a hero and his plight an important consideration when we as a nation think about sending troops into combat. Thanks Ernie, for sharing this great story. Mr. Meyer’s experiences (and your storytelling) certainly provide a lot of insight, as well as an interesting read. MR Meyer was my firechief on diego garcia . I learned so much from him funny thing though , dad was in danang the same time he was. I miss workin for lew. Newer Article: Let the Budget Wars Begin!